Souvenirs are usually regarded as pieces of ephemera and reminders of happy times. But some may have sinister undertones. There are examples, from different periods in history, of soldiers at war looting and returning home with their booty as well as, more recently, pieces of shrapnel, or badges from the uniforms of the fallen enemy. In 1876, the New York Times reported that souvenir hunters had taken the skull, some body parts and uniform of Colonel Custer, after he was killed at the Battle of Little Bighorn. Prisons have also been places for souvenir hunters of what is known as Dark Tourism. These are not the souvenirs collected by prisoners or their families, but by tourists visiting prisons, no doubt just to gaze at its walls. Between 1834 and 1930 thousands of people paid to tour the Ohio State Penitentiary and bought souvenir cards of the portraits of executed prisoners. Sinister tourism – a souvenir of the gates of Princetown Prison on bleak Dartmoor. The image shows the outer and inner gates, wardens and prisoners. The piece is made in Germany, 15cm high, c1890. During the Napoleonic Wars French prisoners of war were held in a camp at Princetown high up on Dartmoor, in Devon. In the 1850s the camp was redeveloped and a prison built to incarcerate the most violent British convicts. 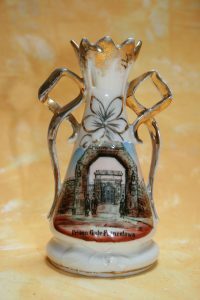 This ceramic vase, about 10cm high, was one of many manufactured between 1890 and 1910 for a growing souvenir industry. 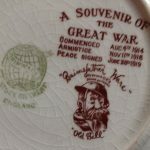 The majority of these souvenirs – which included decorated plates, cups and teapots – were made in Germany and exported to Britain, and showed innocuous views of seaside resorts, famous London landmarks and country scenes. However, a few, like this one, were made specifically to sell to tourists visiting Dartmoor Prison at Princetown. The prison wall and gates guarded by prison officers are clearly visible and beneath are the words ‘Prison Gate Princetown’. Yet, with its swirling, gold coloured handles and flower motif this vase could well have supported another image of a more uplifting place. During World War I (1914-18), The Great War, the Grimwade ceramic company in Stoke in Trent was granted the licence to reproduce Bruce Bairnsfather’s cartoons in a series called War Time. These dishes, souvenirs of terrible times, have numerous images of life in the trenches of Northern France, and Belgium, with soldiers taking shelter from over head raids, rifles at the ready. 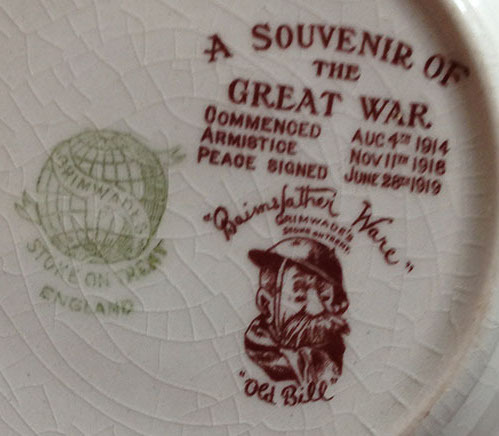 The trademarks on the reverse clearly mark each one as A Souvenir of the Great War. 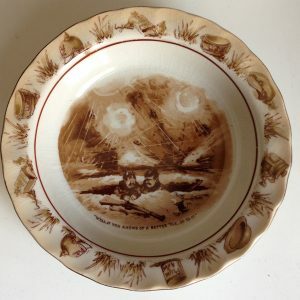 At the time the Pottery Gazette did observe that these were souvenirs, for generations to come, of the most stressful period in the world’s history. These pieces are some of the many in Deborah Jaffé’s extensive collection of mass market, ceramic souvenirs from the 1880s to 1960s.